Exploring, constructing and distilling the complexity and often undervalued beauty of contemporary landscape and interiors, Edmond Praybe’s recent body of paintings This Is Where We Live, attempts to find the poetry in those places, spaces, people and things. 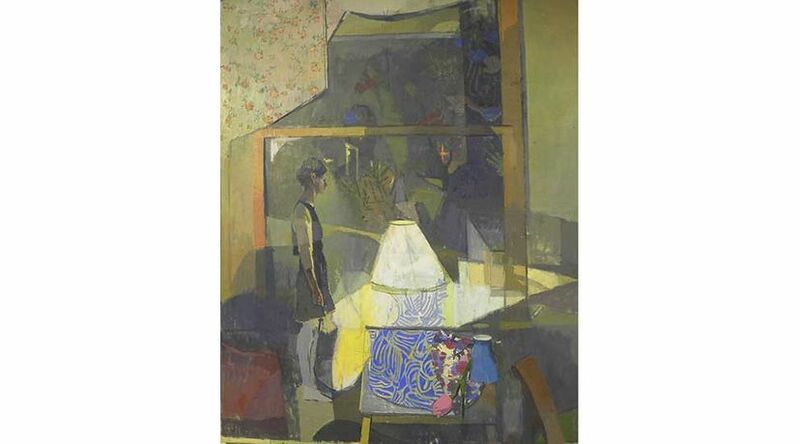 This group of paintings, depicting scenes mostly based on views from inside or out of Praybe’s home, ruminate over quiet moments and unexpected sights. A group of trees or a suburban siding-wrapped house, passed by everyday, change when you truly look at them and take the time to see them in a larger context. A warm evening light enchants banal rows of houses, trees and cars transforming them beyond the potential of their function. The paintings take in the small piece of world that the artist inhabits and reexamines its visual as well as narrative meanings. Praybe’s work attempts to uncover the hidden layers in what, on the surface, may seem unremarkable or commonplace. The problem of perceptual versus studio constructed painting is also of marked interest in this collection of work. How does one latch onto key moments of revelation in observation, disassemble and finally reconfigure in a meaningful manner, the pieces to make a coherent image and statement? To this end these paintings go through a rigorous process of back and forth revisions from on-site observational sessions to studio reworking until a cohesive image emerges. Resolution can be reached only when the painting teeters between abstract formal awareness and just the right amount of specificity in the image. It is a matter of incident versus economy, what to show and what remains hidden. Each painting endeavors to find a balance between what is seen, what is remembered and what is felt about the particular motif. This Is Where We Live is Edmond Praybe’s first solo exhibition at First Street Gallery. His work has been shown in many galleries in the U.S. including Manifest Gallery in Cincinnati, OH, Prince Street and Bowery Galleries in New York City, The Mitchell Gallery at St. John’s College and The Maryland Federation of Art’s Circle Gallery in Annapolis, MD as well as The Bridge Gallery in Shepherdstown, WV and Benfield Gallery in Severna Park, MD. Notable art critics Jed Pearl and David Cohen have included Praybe’s work in juried exhibitions. In 2012, he was the recipient of the Hohenberg Travel Grant for the study of art in Europe. Praybe currently teaches landscape painting at Anne Arundel Community College in Arnold, MD. He received his BFA from Maryland Institute, College of Art in 2004 and his MFA from the New York Studio School in 2012.